Double and single hungs glide vertically. 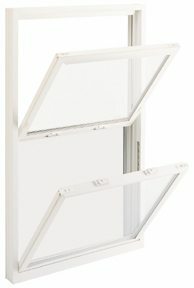 One and/or both panels can operate thus creating “single” or “double” hung. The panels are known as sashes. A balance system allows the sashes to move up without falling down. Double hung windows come with night or vent locks limiting the sash to open two inches. The night lock minimizes ventilation. While the benefit of the night lock adds safety for children and pets it does not provide security to the home. To clean, move sash to middle of frame and use latches on the side of the sash to tilt inward. 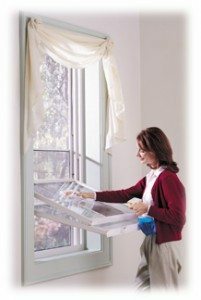 To clean effectively and safely only tilt sash to 90°. The use of a chair may be beneficially to rest sash at 90° while cleaning. Double hungs are offered in Bay and Bow applications.